A Liberal's Libretto: Sydney Opera House - dangerous risk of "multiple fatalities"
Sydney Opera House - dangerous risk of "multiple fatalities"
An engineering report says that the Sydney Opera House's stage machinery is in such bad shape that it poses a danger to performers, and that an $800 million [Aus] renovation is necessary. Now, after the threat of closure, The New South Wales government is reportedly planning to allocate $130 million [Aus] to the theater over two years for repairs. 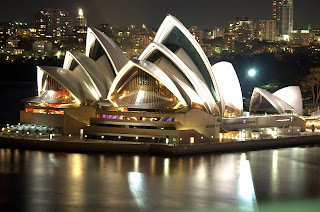 The Opera House report from engineering firm Marshall Day Entertech warned: "There is a real risk to persons on stage or being carried on the flying system from a malfunction or fault with this installation and a similar, although lesser, potential risk when people are carried on the transport elevator." The report warned there was a risk of "multiple fatalities" and said the theatre's flying system was "non-compliant with current international codes and practice". The Opera House has been lobbying for funds from the government since 2000 ... 10 years later repairs can begin. Gee, it only took the threat of closing one of the most iconic buildings in the world to get the government to pony up.